This story is one of a six-part project for the Reporting and Writing course which included surveys conducted by journalism students who talked to different groups of 100 SCSU students each about various topics. The surveys were conducted in mid-April over one week. The topics reviewed concerned campus safety, Wi-Fi, access, Buley Library renovation, campus shuttle service, favorite NFL teams and school spirit. 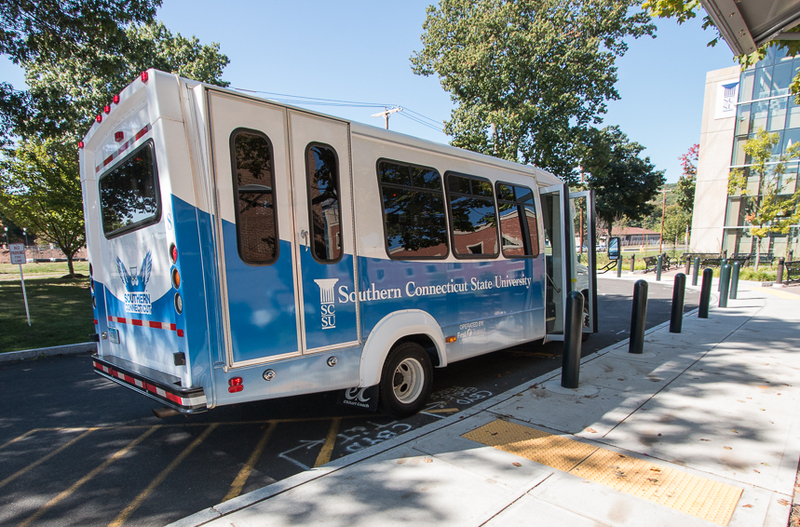 The shuttle service on the university campus may be dependent on many students to get around campus, the union station, the Hamden Plaza, and more. The service is offered on campus by the University Police Department, according to the official SCSU website, which currently runs five shuttle routes. ”The SCSU shuttle system operates on a fixed route schedule, providing safe, convenient, and reliable transportation throughout the campus and surrounding community,” stated the website. There are 10 enclosed bus stops on campus and all shuttle drivers are licensed and employed by First Transit. “On-campus shuttle service is available Monday-Thursday from 7:30 a.m.-11:00 p.m. and Fridays from 7:30 a.m. -5:00 p.m.” stated the SCSU website, about the shuttle schedule. On campus, the Full Campus Route runs from all residential and academic buildings and parking lots. The university website stated that the route is a campus circulator and provides service to each stop every 20 minutes. Matt Violano, a sophomore public health major, gives the shuttle service a grade of a B. “There’s not enough shuttles, sometimes I’m waiting for 20 minutes. It’s ridiculous. I live off campus so I usually take the shuttle from Wintergreen to Engleman,” said Violano. The Full Campus Route features Wintergreen Avenue Garage Express, which is a route from the Wintergreen Garage to the Main Campus. The Express route runs every five minutes. Helen Homa, a junior therapeutic rec. major gives the shuttle services a grade of a C.
Christina Woehrle, a junior history major and commuter, gives the shuttle services a grade of an A. “I never have to wait that long for a shuttle. It easier than walking, especially when it’s raining. The only negative experience I’ve had while on the shuttle is people that talk too loud on their cell phones,” said Woehrle. According to Chief Dooley from the University Police Department, they have yet to conduct a survey of their own regarding how students feel about the efficiency of the shuttles. As of right now, shuttles are adjusted by class schedules and train schedules, but adjustments can be made where they can. The off-campus shuttle service features the Union Station Route, which runs from campus to the Union Station in New Haven. The route stops every 30 minutes at two stops. “The outbound stops from campus to 900 Chapel Street are located on Temple Street, past the intersection of Chapel Street. The inbound stop from Union Station and returning to campus is located on Chapel Street across the street from 800 Chapel [utilizing existing CT-Transit stop],” stated the SCSU website. Overall, the shuttle service earned a grade of a B, compiled of 20 students that were randomly selected in the Adanti Student Center. Students were generally pleased based on comments left on the surveys, with the exception of the wait time for the shuttles.